Lee “Sally Messy Raphael” Grant, William “Pronounces it ‘Shah-tner’” Shatner, Michael “Deadside Manner” Ironside, Linda “Ritchie Cunningham’s Squeeze” Purl, and Lenore “My Future’s in Voice Work” Zann. Deborah Ballin (Grant) is a TV talk show host whose vehement defense of battered women and staunch anti-violence platform breeds controversy. Her producer Gary (Shatner) has to stand up for her often but lacks the spine to deal with her volatile, non-Vulcan temper. After a particularly contentious interview, she returns home to discover someone has broken into her home and murdered her maid. The naked intruder attacks and slashes her arms but she is able to escape in a dumb waiter. Rescued by a neighbor, Deborah is taken to the nearby county hospital. We learn that the attacker is a sadistic, disgruntled viewer with a particular hatred of the media, minorities, and women. The disturbed assailant is Colt (Ironside) works as an overnight custodian at Deborah’s studio. In his spare time he writes threats to judges and other public figures and hangs the letters on his wall like trophies. He has killed before, preying mostly on older women whom he photographs and then creates a clip-out montage of their dying faces. I prefer skull mosaics made of happy turtles. He is troubled by memories of abuse by his disfigured alcoholic father who now mentally deteriorates in a nursing home, scarred by grease in a fight with Colt's mother long ago. 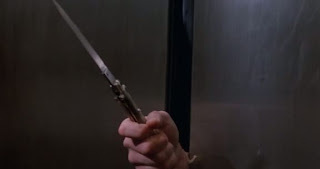 His murderous fetish of choice is a trusty switchblade that covets like a body part. He seduces and abuses runaways yet is desired by crazy old ladies and lonely waitresses whom he openly despises. And worst of all, his apartment is really untidy. Actually, the director’s office after the last day of shooting. Meanwhile, Deborah is going batty with fear in the hospital but Gary is right at her side. Movie Kirk hair and tapioca heal the pain. Colt infiltrates the hospital to finish the job on Deborah. He takes out a few old broads, an orderly or two, and some chubby mouthy nurse who likes to openly rank her lovers on a scale of 1 to 10. When spunky nurse and single mother Sheila (Purl) witnesses Colt’s dastardly deeds, she’s brutally attacked but manages to get away. She goes home where the threat of the madman’s return haunts her front door. Fortunately she has a recently showered partner to comfort her. Meanwhile, Colt seems to get nuttier and goofier and more off the deep end in his obsession to kill Deborah. We finally learn that the lynchpin to his trip to Cuckoo Farms on Mixed Metaphor Road was Deborah’s vigorous advocacy of a woman who killed her husband in self-defense which elicited upsetting memories and sweaty over-acting in him. 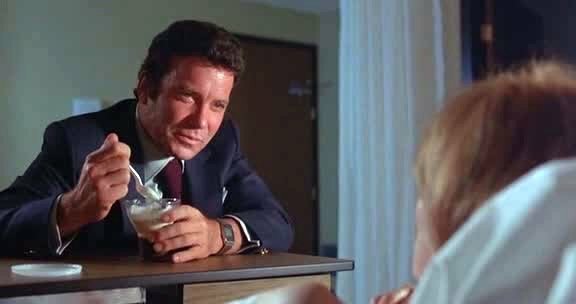 Colt continues to stalk Deborah, Sheila, vengeful runaway Lisa (Zann) and nothing from inept Canadian Mounties to Shatner’s shoulder thrust to a strongly worded doctor’s note will stop him! 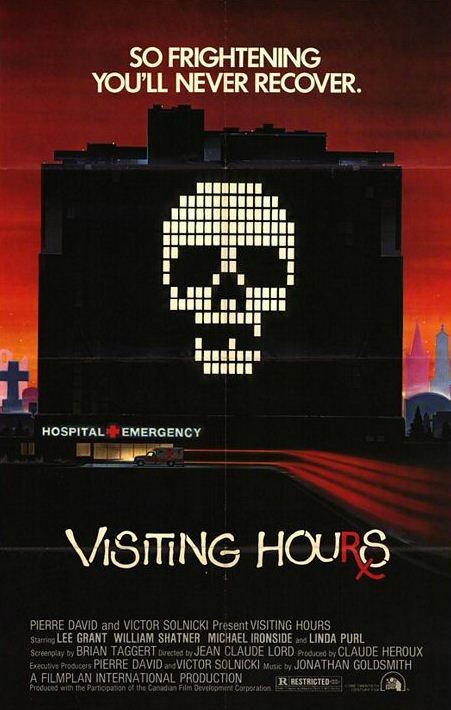 Marketed as a medical horror show (I still remember the movie’s distressing video box residing in my do-not-rent nightmares as a kid), Visiting Hours is more a psychological thriller repackaged to compete in the slasher movie glut of the early 80s. Aspiring at times to become a Canadian giallo with its pseudo-Goblin soundtrack, bizarrely ugly sexuality, and the killer’s phallic switchblade, the movie is nonetheless a complete drag with slow pacing, disinterested main actors (though Shatner is all-pro), and a total lack of atmosphere for scares. Unlike its contemporary horror flicks, the movie is void of dread and suspense; we don’t fear that the murderer could strike at any time. That’s because we see the killer, we follow him around, we know his every move and motivation. We’d follow him into the toilet if that explained his crazy, for crying out loud. 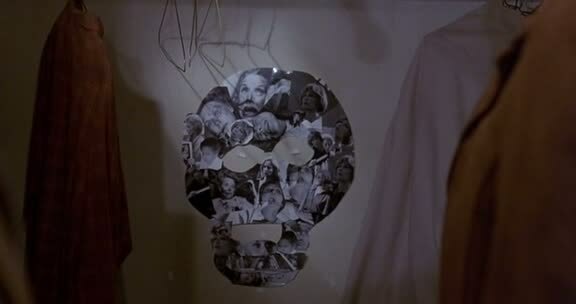 That said, Ironside does bring a whole mental ward of madness to the role of Colt. He’s is scintillatingly creepy, even today an underrated visceral actor who makes every B-picture feel like an A. But in the end, Visiting Hours overstays its welcome. Plus there’s no Dr. Giggles, The Dentist, or hell even a Nurse Ratched! What the hell, man?